Thought I would start a new thread as I have moved onto other locos. 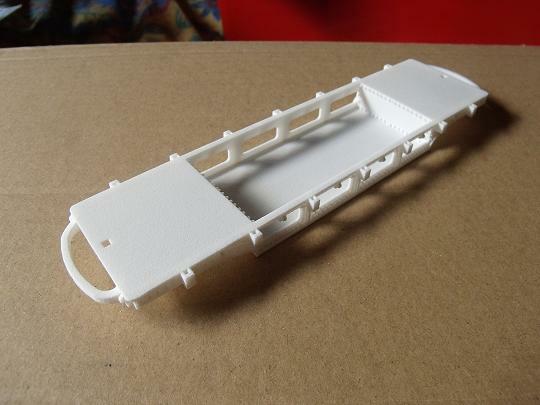 I am working on my first steam loco, the Decauville 8ton 060, and that is almost ready to test print. Always find something extra to add. My Laptop is also starting to groan over the more complex designs. It should not be too difficult to modify the design to produce the British built Kerr Stuart Joffre version. Chassis is similar, but the body is slightly longer, and there are fewer rivets. I am hoping to use the Bachmann USRA 060 steam loco chassis as its so close to right size. Hopefully my messing around comparing the chassis with the drawing means the body will fit like a glove. Fingers crossed. I have even sussed a way to put the rivets on a curved surface, so might (?) modify the Simplex in the same way. Never say something is easy to do. On comparing the Decauville loco with the Joffre, I found there were more than a few differences. 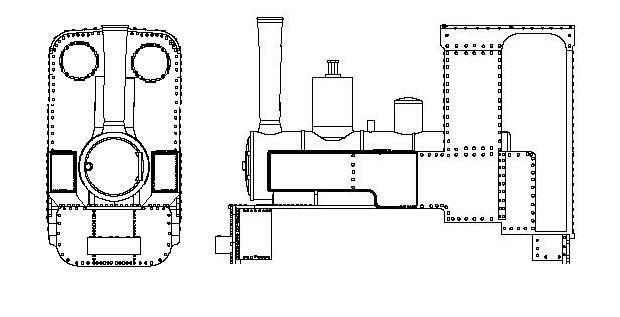 Boiler and cab positioned differently, various other fixtures in different relative positions. All I wanted was to ensure chassis would fit, but ended up stripping the design back to basics and starting from there. Hopefully got there in the end and both are now sent off for production. As there was a special off on I wanted to get them sent off quickly as it would almost pay for one model. I do now feel more confident with designing models, so might look at that Gn15 loco that was mentioned a while back. Can't find the thread at the moment. 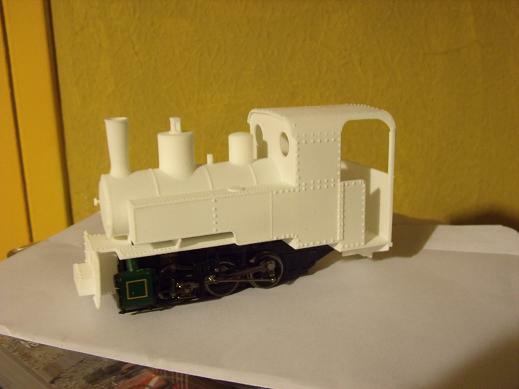 Well, there are at least two printed Gn15 steam locos abvailable at the moment. Tebee´s interpretation of a Decauville is a sort of Anglicized version of one I'm afraid - it started as being a totally different (English) loco, which someone said reminded them of the Jouef interpretation of a Decauville so I made it look a bit more like one ! Tom, nice loco, I could not see it on you shop window so probably not released. just need to make a couple of alterations, including putting in fixings for the bogie. The rivets have also come out a bit bigger than expected(can sand down easily) but will modify, as no point paying for waste plastic! I also need to modify the bogies slightly , and possible include the brake handles. Not sure about the stanchions yet as filling might be tricky. Even in this scale I am working at the limits of minimal thickness. It is not always, or desirable to 3D print everything, so using a metal pin to join stanchions to their supporting brackets might be best way. What are you using to represent you rivets ? For wagons and small scale stuff I normally use a cylinder, which is easier to draw and keeps the polygon count down, but for locos I use a hemisphere ( infact I draw a sphere, but with it's center level with the surface so it appears as a hemisphere ) which although deeper than a real rivet seems to give a better representation. Also, because it drawn as a sphere you don't have to worry about rotating it if you repeat it around a curved surface. I think the reason I never released that loco was because it was designed to fit on the Bachmann Percy chassis and I never got round to buying one of the chassis to check on the fit. I have a couple more Gn15 steam locos almost ready if anyone is interested, these where vaguely inspired by Ralph Brammer's (rockleybottom) ones for Smithies yard - what has happened to him these days? I saw one tantalizing picture of the 16 ft version of the layout and no more. Anyway will have to start my own thread for these instead of messing yours up. Rivets, nothing as complex as a sphere. I just work in 2D and use circles. Then extends them out by point5 mm . In this scale , especially when painted I don't think you can see them that closely, and once painted. It works OK in the cheaper plastic but not sure how they would turn out in a finer plastic, which is why am happy with the basic quality. It might mean more design work, but I prefer to work in basic mode, as it is normally easier to fix when something goes wrong. Thats something I have learnt working in IT, and something many fail to realise in IT these days. For bigger scales it might make a difference, but that is one of the secrets of model making, finding something that works in one scale. Mistake is to think it will work in all scales. The reason suggest using spheres is that locos tend to have curved surfaces like smokeboxes and saddle tanks. If you use a circle extended into a cylinder as the rivet if you want to repeat that rivet along the curved surface you need to use a circular pattern based on the center of the curved surface, like spokes in a wheel. If however you use spheres, you can use a normal rectangular pattern following the curved surface as direction. If you tried to do this with the cylinders the rivets would start to lean over as you went round. So it's a little harder to draw the first one, but the repetitions are simpler. Both will give a decent representation of a rivet in the scales we use, particularly in WSF which tends to round corners off anyway. not too many of curved surfaces have rivets. I left them off on the original Simplex, but might add them in the future. For the 2 steam locos I created a temporary squared off shape to follow the curve as a platform to fire off the rivets, then cut the rivet heads and erazed the temporary platform. I await the results but can't see there being any problem. How about some pictures of your printed pieces. still waiting for some to be printed. the main ones so far are the Simplex locos. Pictures of these are on my Shapeways shop site, link via my website below. One thing I have found out is that it takes a lot longer to process large order than a small one, and I have one big order in at the moment. Suspect time of year is also slowing things down. I will post more pictures hen I have them. Still some more work to be done before letting them go on sale. looks like most of my new models are on the way. Good thing about them using UPS is that you can track them and they are normally pretty accurate. I am sure others designing models get people asking if they can produce the model in another scale. I chose to start in 1/35 as its well supported by military kit manufacturers, and OO track was nearer to 2ft gauge than if I had modelled in 1/43 or 1/48. I can up models to 1/32 scale which I use to model 50cm gauge, but I can't reduce size without starting again. That hasn't stopped people asking though. Amazed no-one has produced WW1 railway stock in O scale yet but 1/48 hasn't been a popular scale for military modellers. I would expect to see some items soon, there is already a 20hp Simplex, and I think there might have been wagon kits a few years ago. Although I am keeping with my Gn15 modules, my prefered scale is now 1/35 and 1/32, depending on the era being modelled, and that includes plans for 15in gauge using 12mm gauge track, which I think is a sadly neglected scale/gauge combination. I can also model 3ft or metre gauge using 32mm O gauge track and standard gauge using gauge 1 track,not forgetting using 9mm gauge for even smaller minimum gauge(around about 12in), so for me its the right scale. Still can't properly understand why the gauge 1 people thought moving to 10mm/ft was a good idea, especially as it has allowed the toy manufacturers to confuse G scale. Talking of using 12mm gauge I am thinking of trying to adapt some of Steve's wagon kits, as I have an excellent source of 12mm gauge wagon wheels. Would this be referred to as G1-12, leading to the possibility of G9, as well as G1-9. I think I will just say what scale and gauge it is, much easier. When I thought about it I realised that to convert from 1/35 to 1/43.5 was only an 80 % reduction. This brought plastic thicknesses to close to minimum and would probably get rejected, so just went through the code/instructions(20 years in IT comes in useful sometimes) and upped some of the thicknesses so they would not go below minimum after reduction. Hopefully this works OK but as I am not interested in O scale I am not getting it printed, but the person who made the request has been informed so have to wait and see. If it is OK then I might convert some other wagons. The big Simplex should reduce, but the interior might take more work, and will need some adjustment to fit motor chassis. The other locos might be too complex, not sure yet. One other thing is that because wagon chassis is narrowed might only be suitable for 14mm gauge, unless I put a simple mod in place. Just like programming, taking it one small step at a time. I used to tell people a modification might not be possible without a lot of work(sales staff would hate me for not saying yes every time), so when I actually deliver they are even more pleased. just made the 2 steam locos viewable. hopefully will get test prints back soon. will need to modify to fit chassis , as it was only an estimate I started with. As with my other models they are to approximate 1/35 scale. It might be possible to reduce, but I have to do it manually. In theory more work, but means I can tweek the model differently for different scales. This is more relevant with a loco where it might need to be modified for different chassis. Maybe I am odd *would not be here otherwise) but I actually quite enjoyed the challenge of converting the D wagon down to O scale. Just have to go through each line of code, modifying as required, the scaling down. Having said that I would not want to make them any smaller. It would have been easier had Bachmann put the motor in the middle not at the back. I think otherwise this chassis would be used a lot more. Trouble with Gn15 is the size. Would be looking at a large chunk of money(at least 3 times as much as in 1/35). This project is giving me the chance to not have to dream up my own designs, just base it on a real locos and stock. Fun in a different way, and a challenge. Finding chassis is most difficult part, which is one reason I am less bothered about rivet counting. Its getting easier, but still fixing some of the small errors in earlier stuff. Just knocked up model for the Deutz WW1 loco. It will hopefully fit a Lima 040 steam engine chassis. Pity the motor will protrude into cab, but ill find a ay to hide it. There is a French petrol shunter that will fit the Lima BR 08 shunter chassis. Hopefully will work on that next. Then there is one of the German 080 tank locos. Problem with 080 locos is that most of the HO and OO models have heels too small , but I have a Lima 141R which might do. Not outside framed but I am prepared to put up ith that. I fancy one of the double ended Baldwin steam locos. Have not worked out a chassis yet. Ideally neds 20mm diameter wheels, which is bigger than most small 040s and smaller than most bigger locos with 4 driving wheels. Again not bothered about outside frames. Would be happy with simple valve gear. Might see if I could re-wheel one of the Hornby locos. Easier to get on with designing the loco bodies and worry about the chassis afterwards. It wouldn't work as a Gn15 loco - it's 2ft gauge and much bigger than anything that ran on 15 inch gauge. If you try scaling it up to the right scale it will tower over anything else. 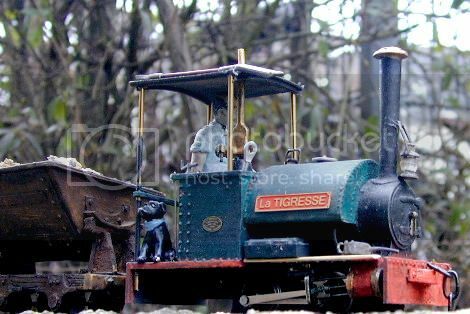 Only way would be to make it to an intermediate scale and adjust the dimensions so a G scale man could still get in, but then it's a freelance loco anyway. That (scaling) would be perfectly all right with me! Would not require much to turn it into a Gn15 loco, just increasing height of cab, and boiler fittings. Would not want to mess around much more, as it is too easy to go wrong(thats hat happened when I tried to convert it to Joffre version). Something to try when I have a spare couple of hours. I think I might start by modifying drawing, before trying anything more complex. here is a simple mod streching cab etc, leaving most of the rest unchanged.might lose the rivets on roof, depending on time to reposition them. its a very rough mod, would have to think about new heights more, possibly. Have increased size of spectacle windows slightly. From front definitely looks miniature rather than narrow gauge. An update. Almost ready to make most of what I have produced available. Just need to wait to see if everything is OK. Next week hopefully. Anyway, one problem with 3D printing for wagons is the weight or lack of it. I have found that on my original roughly laid track(which I further modified to try and get round problem) on my module, they don't run as well as they could. This is not helped by the finer scale treads on the wheels. Older HO based stock(eg Fleischmann tipper trucks) run through the points perfectly. Its not just lack of weight but the wheels, as they run fine on my point-less modules. I do have some Lilliput wheels which I might test out. My Bachmann On30 tippers sometimes fail as well and they are heavier, so main problem is the wheels. Not really a problem as the original module was designed for multi-temporal set up, ie it could be used to represent various time periods, and these would use the Fleischmann wagons. I have a couple of Magic Train diesels which run perfectly. Hopefully I will be displaying my other mini layouts at exhibitions so the 3D printed stock ill get an outing. some locos and wagons now 'live'. Unfortunately I only noticed on one loco that I had not added commission(now remedied) , so first sales gave me no commission. This is one thing that Shapeways could amend, so producer can see both original and sale price on same page when viewing item, rather than having to login/log out to compare. I have noticed a small problem on Shapeways website/shop, when I updated models for sale, some details did not update. It was the value i put in commission. I originally thought I had not put value in on one model, so was ultra careful on next batch. After being asked to offer the better quality material for some models I noticed some more missing values, updated them with new option, but then noticed not everything updated, tried again, made sure I saved and it then worked. Either it is a timing issue, and I was checking too soon, but the new option was updated. In some cases the commission value was not being updated. I am now going to have to check and double check each time I update, as I have already lost one commission payment.